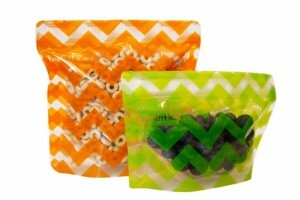 Win Squeez’Ems and Pack’Ems Reusable Food Pouches from BooginHead. Appetite For Health is going to make 10 of its fans very happy when they win a duo-pack of Squeez’Ems and Pack’Ems from Reusable Food Pouches from BooginHead. On-the-go women appreciate great products with purpose so it’s no surprise that we loved Squeez’Ems and Pack’Ems from the first time we saw them. 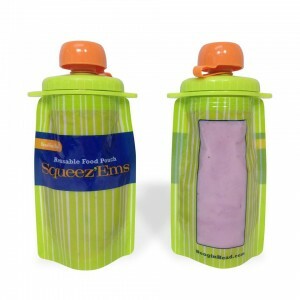 Squeez’Ems are perfect for any pureed or blended foods and Pack’Ems are awesome for packing on-the-go snacks. Pack’Ems come in both large and small and feature a gusseted bottom for easy, stand-up design. They are easy to open and close with unique VELCRO materials and they’re made of durable, environmentally friendly plastic that holds up through multiple washes and keeps food fresh longer. Sqeez’Ems are dishwasher-safe, easy-to-clean, BPA, PVC and phthalate-free. Reusable, recyclable and affordable, what’s not to love! Pack’Ems are available online at http://www.booginhead.com/pack-ems/ MSRP $9.99 (1 large, 1 small) for a 2 pack. Eco-friendly and BPA, PVC & Phthalate FREE! The new screw top lid prevents accidental openings because of a tighter fit, making it 100% leak-proof! Easy to fill, clean and store. Freezer, microwave and (top-rack) dishwasher safe. Fit perfectly in your children’s small hands. Pouch has a peek-a-boo window allowing your children to see their favorite food. Designed with the lunchbox in mind and they travel well too. 2. “Like” Appetite for Health on Facebook and like BooginHead too. 3. Leave a comment below (not on Facebook) telling us why you’d like to win this prize. Open to all residents of the continental US only please. Entrants will be accepted until midnight EST on October 22, 2014. All AFH Terms and Conditions Apply. I’m all about creative lunch packing. This product would be perfect. Those bottle look so cool. I bring water bottle every place I go and a lot of times I drop them. There look like they would fit much better in my hands. They looks so awesome! I would those because I always take some kind of snack with me on the go. I get your Newsletter and LOVE it!! I also like you and BooginHead on Facebook! I would love to win these because I have grandchildren that I could use these for when I have them for the day and we take road trips. These would be a huge help. I also shared your article on “Six Foods that Could Save Your Bones” on Twitter. Here is the link: https://twitter.com/icalledonjesus/status/522384523620007938 . Thanks for the great info. I never knew that almonds would be in this category. Very helpful!! I love that they are reuseable, hate throwing away zip bags every time I pack a lunch! They are a green product, improving the environment, and they are way cute! Great ideas for sending snacks to school with my daughter. These would be terrific to pack snacks for my grandchildren when we go on outings. I clean and re-use plastic bags, the zip-top kind, but it gets tedious and messy. And they really aren’t good for blended, squeezable mixtures. I would love to win. Would like to limit the amount of zip lock bags I use and go a little greener where I can. I pack a lunch every day and would make it easier and limit zip lock waste. My kids and I are all about eating healthy (most days!). e pack school and work lunches on a daily basis. Squeez’Ems and Pack’Ems would sure come in handy! These would be practical for my walks and the outings with the grandchildren. So easy to use, good size and very convenient. These would be great for my nephew’s 2 little boys. They’re reusable and would be super convenient. It would be wonderful to have these for traveling and convenient snacks for the kids. I am already your fan on facebook, twitter and google plus, as well as already subscribed to your newsletter. I would love to win because because not only must my son take snack to school daily and it can be difficult to transport in his back pack, but these would be great for me as well when carrying snacks in my purse. My family is always on the go! I like you and Booginhead on Facebook and get your newsletter. I need something I can squeeze when I have only one hand available to feed myself, usually on the go. Most often in the car but sometimes walking. It’s very handy! I’d like to use this to transport my lunch to work each day. I hate using regular plastic bags; it feels so wasteful throwing them out each day! I would love to win this since it would make bringing lunch to school a snap! I would love to win this because I would love to try the squeez’ems so I can make homemade gogurt. We’ve been making a concerted effort to cut back on the amount of waste our household generates, the bags and squeeze bottle would definitely help us towards that end. This is great for the whole family and it not only keeps the family healthy but the earth. I do like both on Facebook as Maryann Drapkin and I am a subscriber. I would love to have these since I always bring my lunch to work, I could really use this product. After reading the article on booginhead.com, I really want to win this for my grandsons! I’m a big fan of anything reusable. I go through a lot of baggies and these would help out in a big way. These would be great to pack in my son’s lunches! I read all your newsletters and have liked both on Facebook! I aso share many of your tips in my nutrition Healthy bites newsletters. I would love this prize because I puree a lot of fruits and veggies, including my favorites: avocado with sweet potato. This would even be a fun way to serve hummus on the go! These would be perfect for our family on the go. I am a homeschooling mom, two of us with food allergies. These would help to keep us healthy while still enjoying all the activities outside of the home that we would like to participate in! Collapsable storage for easy stashing in the mom purse, and reusable! I love this idea! I LOVE the concept of being able to reuse them over and over again. Also it’s great that they go in the microwave, refrigerator and dishwasher. I don’t have young children at home anymore, but I do have 5 grandchildren. These will be awesome to use when they come over for a visit. so nice for snacks…will buy these even if I don’t win…. I am a nanny to 5 families with a total of 14 kids and the toddler is forever in the car with me and ziplocs and bowls endlessly get spilled. I usually bring my own food to work and end up tossing the wrapper. This would be a great replacement for everything that i toss out. Then i can keep on bringing healthy food to work and be good to the environment. Always packing snacks to go….These are ideal….I want to try them !!! Squeez’Ems and Pack’Ems Reusable Food Pouches from BooginHead are the best…Will buy these if I don’t win…. I would like to win this because it is reusable. Ideal for snacks on the go !!!!! I would love to win these! I pack lunches for three 5 days a week and these would be a big help. I’d love to win these so I could tell everyone I own a BooginHead. Just like me, I bet they giggle just a little until they find out how ingenious this product truly is! It would create a new way to pack a lunch, a new great way!! I would like to win this because I like to use reusable items! These would be perfect for me at work. this would be great for the kids lunches and mine too…less waste! The winners of these great pouches are: Jennifer S, Tim N, Lori W, Beth McC, Daniele, Lu O., Courtney, K, Maryann D, Michele A, Bernice. You’ll receive an email directly from us on how to claim your prize.